Jamie Moriarty ’15 has always been interested in the Arabic language and culture. 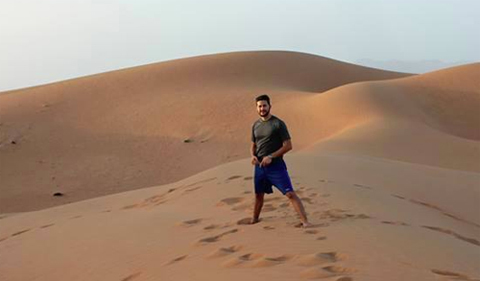 Over the summer, he took the initiative to travel to Muscat, Oman, to immerse himself in the language, make new friends, and broaden his cultural horizons. Not only did Moriarty throw himself into a foreign language, country, and culture, but he did so without the safety net of knowing anyone else on the trip. Moriarty spent a month in Muscat, studying Arabic for six hours every day . “It was pretty exhausting,” he admits. Participants in his program ranged from fluent speakers to students who were just starting out. Moriarty took a placement test and landed in the intermediate level. While he was able to self-assess his need to move up or down a class, he still found the experience challenging, and certainly different from any Arabic class he’s taken at OHIO. Many students take on academic challenges like this for an accelerated course or to get ahead on foreign language credit, but not Moriarty. It’s a move that makes sense for a linguistics minor such as himself, and it will likely benefit him in his future endeavors. “If I were to attend graduate school, I would hope to [focus on] sociolinguistics of the Arabic language,” Moriarty says. He is in the process of applying for a Fulbright scholarship, and he hopes to teach English as a foreign language in Bahrain. 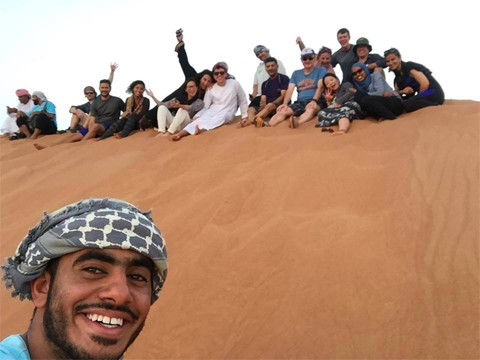 Jamie Moriarity takes a selfie with classmates in Oman. Mango juice wasn’t the only exotic thing Moriarty got to try in Oman. Moriarty’s experiences in the Middle East have undoubtedly made him acutely aware of the cultural lens through which he sees the world, and he makes that clear when recalling the biggest challenges he faced while adjusting to a new culture.